The HoboJeepers of Patrol 1 has roots in the Mile-Hi Jeep Club dating back to the 1960's. In fact, some of our current Hobos were just little kids playing with Hot Wheels when their parents were in Patrol 1 back then. Until the mid 80's, the patrol was active in all types of activities. Back then, the phrase "stocker" Jeep was common. It was mainly driver skill and finesses that got you thru the tuff stuff, and it was the name of the game then. Today, a lot has changed, our rigs are better built for the trails, and more rigs are running them. Also, today brings dwindling public lands to actually run these trails. Get involved with your LAND USE issues in your area. Soon, we'll all be sharing dusty roads with SUV's if we don't take a stand today. 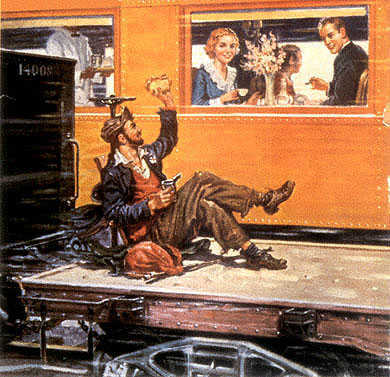 The term "Hobo" is very similar to the spirit of a Hobo who "rides the rails" wherever it took him. We instead, "ride the trails" and bounce around the mountains in that same exploring spirit. Recently in 1995, Patrol 1 was re-activated into the Mile-Hi Jeep Club, and keeping all of its original traditions. In 1999, marked a year of change and new energetic faces. We have a limit on membership at 12 members. We continue to enjoy all kinds of trails in the Rocky Mountains recently, whether they be scenic or rugged and challenging. We are an active patrol within Mile-Hi and believe in club participation, as well as jeeping. Most of our members drive short-wheel based modified (or planning to modify) Jeeps, and believe in the "Tread Lightly" way of team four-wheeling with a twist. We get together and meet at different members houses throughout the Denver Metro area.